My clone-ish 100M panels were from Schaeffer using their UV print process. Not as good as screen printing but still really good. Shame about the “env 1 out” on the second envelope out, could’ve been worse though. Would have liked to have it in grey but couldn’t see that as an option, so strangely it looks a bit 700-ish. And pretty much as big, which I realised later, wasn’t really the point of the 100M. Oh well – it’s built now, and it’s bloody massive. Still going, just about. Not sure what I’m doing with that speed switch yet, whether to go faster or slower, hmm. While I scratch my chin about how to reinforce these daft plastic panels, I’ve been enjoying reading through Fumitaka Ansai’s page on the System 700 – http://anz.yokohama/Museum/Roland/System-700/. Assuming that Google Translate is accurate (my obsession with the System 700 isn’t quite going to stretch to learning Japanese) it’s interesting to find out that the original prototype had internal speakers, like the ARP2600! Also, it seems that users had been asking for a voltage-controlled envelope generator so they’d planned to release one but never got round to it, even in the later 100M. I wonder if it was designed and never released? 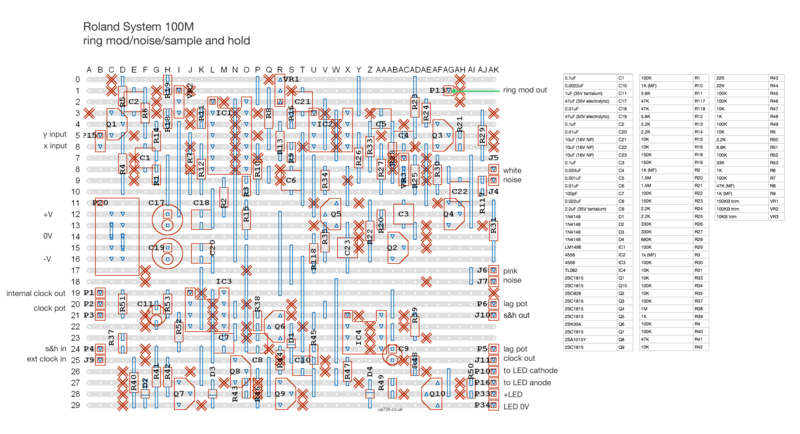 The owners manual for the 700 lists the modules, with gaps at 719, 722, and then 724 – 728, almost as if they intended to fill those gaps at some stage. Actually, maybe the prototype speakers were numbered 719. Anyway, there are some fun demos on the anz.yokohama site too – if you have a look at the patch samples and then scroll down to Sample Chart 5, you can hear a nice example of using a voice to control a squealing oscillator with the 714 Interface. I’m half-tempted to build that one but it’s a big board, and I’m not sure if I’d just spend ten minutes laughing into it and then never touching it after. 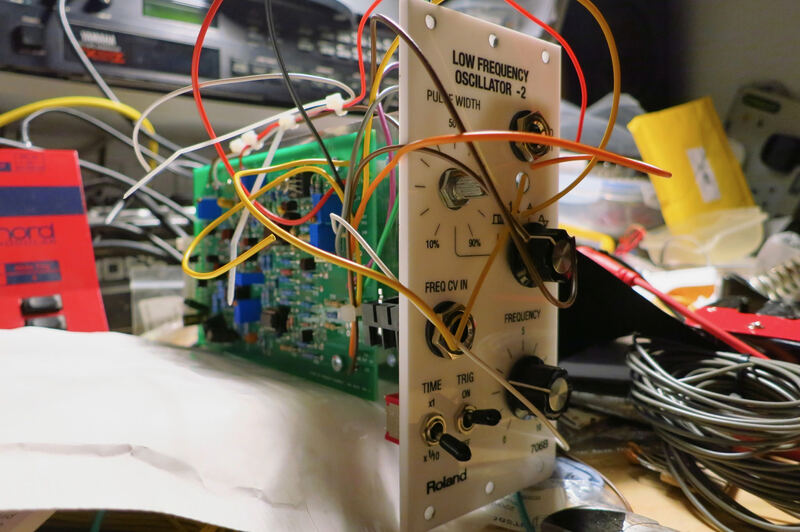 Out of all the various dodgy looking stripboards in my 100M clone, this one turned out the best (let’s just not mention the LFOs, they were a pain in the arse). Determined to get it going first time, I made sure I’d done all the cuts, checked for shorts between tracks, powered up the board without ICs – was generally super careful, and then only later found that I’d missed out a couple of capacitors. Silly. I made a daft mistake with the hold in the sample and hold. It worked, but the held voltage was drifting downwards rather quickly. 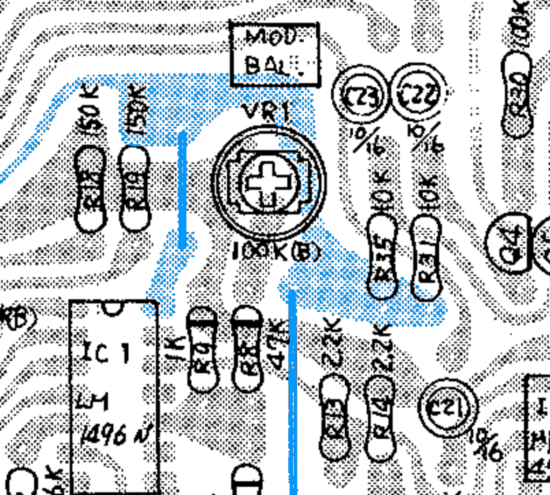 Compared it to my System 700 board and realised my mistake – I’d used a 2.2nF (222) capacitor rather than the specified 22nF (223). 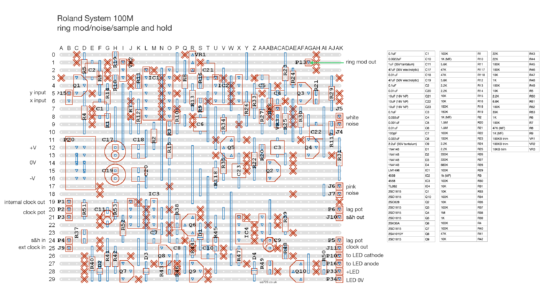 (Actually I was tempted to use System 700 boards rather than faffing with stripboard, but they’re so lazily massive that they didn’t fit in the panel space I’d designed). I compared the white noise to the pink, and the white noise just sounded really quiet. Which is weird because it’s coming out of the same place, it’s just being filtered differently. Here’s the relevant bit of the schematic. I compared the outputs on the oscilloscope – didn’t take a photo, but the white noise was chopped off at 0V, whilst the pink danced around both sides of the ground point as you’d expect. 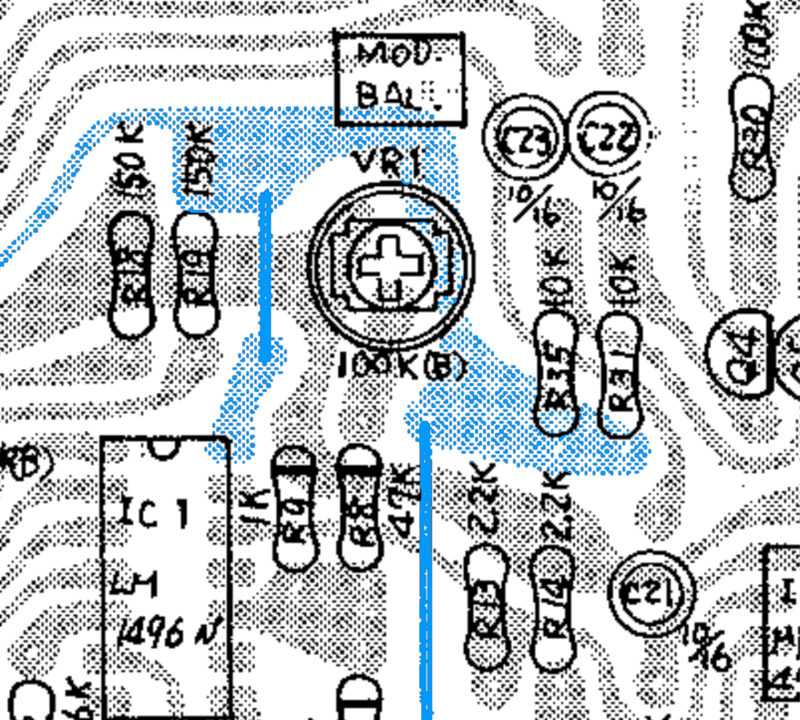 Anyway, it’s pretty obvious from looking at the schematic that the R31 (attached to the transistor output buffer, Q4) should be connected to -15V, and the track layout bears that out. The ring mod is based on the LM1496 like the rest of the Rolands, and you’ve probably got three of those already, but anyway. Here’s a tiny demo of clanking and white noise twiddling. The ring mod was in better calibration when I put it together, it’s bleeding a bit from one side at the moment. 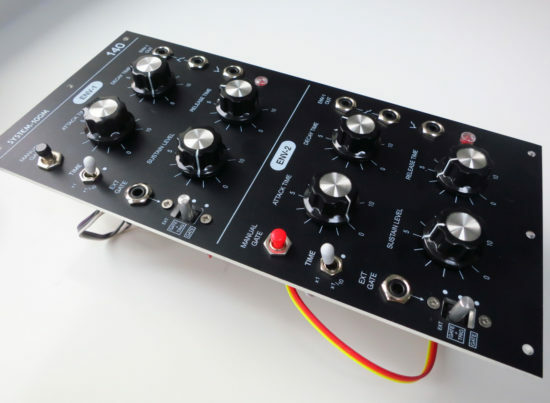 There would be a demo of the sample and hold, but I’m presuming the lag pot has disconnected itself behind the panel, as it’s verrrrrrry smoooothed ouuut, barely even recognisable as a sample and hold right now. Here’s the layout, and wonky BOM. 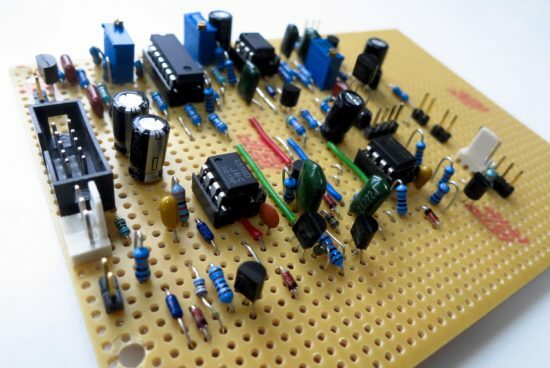 It includes the indicator for the clock out, which has separate ground and +V power supply connections, presumably in an attempt to keep the audio path clear of any clicks from switching the LEDs. On the original (and on mine) this is powered by 22V, but it should work off 15V.